Everyone is on the Nice List at PBDG! Happy Holidays! If you donated at the $50 or more level, there is an original limited edition Pinball Donut Girl poster making its way toward you. 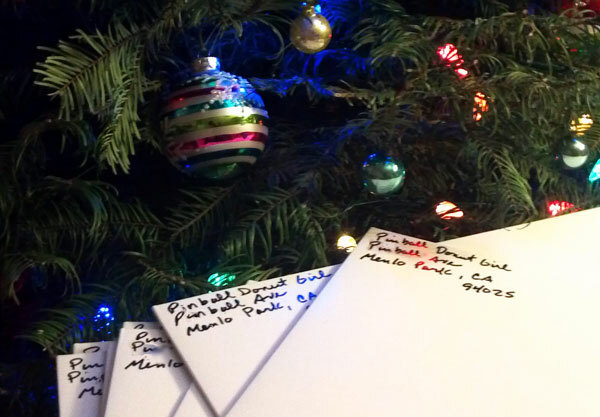 The first batch went out this weekend, so watch for Santa in the guise of a mailman, delivering at your door. I’m hoping to start getting letters in my mailbox too, letters from festivals saying we have been accepted. If any of you have a film festival in your area, especially one that you regularly attend and know people at, mail me and I’ll see if I can submit to them so there is a screening in your area. In the meantime, our sound editor Josh Wolfer of Austin is working on the director’s cut so I can wrap up the DVD and get that out to you in early spring as well. Here is more Christmas Cheer in the form of drive through donuts, courtesy of Mark Czarnowski. PBDG’s most reliable man in the field, Mark has personally tested and approved the Donuts at this shop in Harvard, IL (home of Jersey Jack’s midwest headquarters!). PS: if you mailing address has changed since you donated, and I don’t already know you have moved, please send me your new address so your poster arrives correctly. 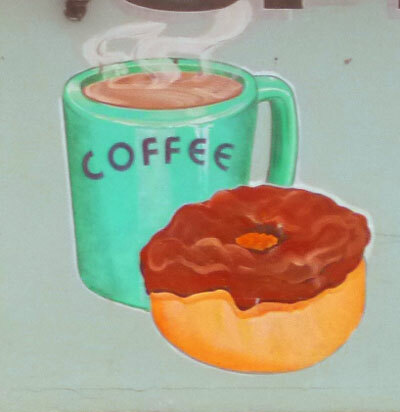 This entry was posted in donuts, News, Pinball People, Vintage Pinball and tagged art, christmas, donuts, film, harvard IL, illinois, jersey jack, mural, murals, pinball, pinball donut girl, posters, travel by Anna Newman. Bookmark the permalink. Thank you for the post card. It arrived today, the fourth of January in Belgium. I wish you a healthy and successful 2013. Hello- Just wanted to stop by & drop of a star toward “The Blog of the Year 2012!” http://fictionalmachines.com/2013/01/15/blog-of-the-year-2012-nine/ Keep up the amazing work & enjoy the day! Thank you to everyone who sent mails and nice responses for the posters. I’m so glad you all are enjoying them. I especially loved the photos people shared of framings in their home!